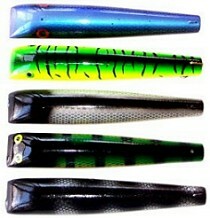 BOBBIE BAIT is pleased to annouce the addition of two new crankbait models. 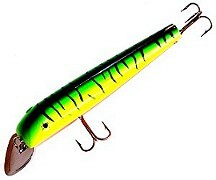 By incorporating the unique BOBBIE BAIT profile into it's design, this bait was designed to cover alot of water, whether casting or trolling with alot of wobble and bellyroll in deeper water applications. These 6 1/2" and 9" models are constructed with the same strudy materials used in the world famous jerbait.....pine bodies, stainless steel tail and durable mustad hooks.....To give this bait a unique beefier profile. A definite plus is the stainless steel lip that makes this lure indestrucable when beating it up over rocks and gravel structures.